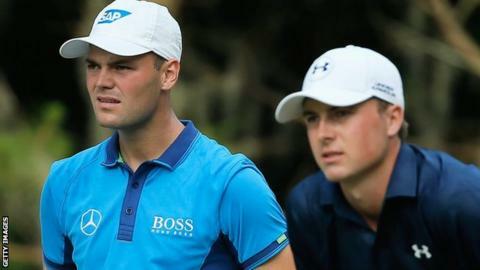 Germany's Martin Kaymer and American Jordan Spieth share a three-shot lead ahead of the final day of the Players Championship at Sawgrass. Both struggled to score in round three, with Spieth one under on the day and Kaymer's bogey on 18 keeping him level par - 12 under for the tournament. Sergio Garcia - champion in 2008 - shot 69 to join American John Senden on nine under, three off the lead. England's Justin Rose and Lee Westwood are two strokes further back. Westwood, six under at the start of play, started quickly with a stunning second shot into the green on the par five second, setting up a simple eagle putt. He remained two under for the day but dropped a stroke at the last to sit seven under for the tournament in Florida, with 10 players in all within six shots of the leaders. At stake is a £1.07m ($1.8m) purse, a five-year exemption on the PGA Tour and a three-year exemption to the Masters and British Open. Joint leader Spieth, 20, will have a chance to become the youngest winner of the Players Championship, but will have to be better off the tee on Sunday after needing some great rescue shots to pull out pars. Spieth said: "I was all over the place. In order to win, I'm going to have to drive the ball better. Today I got the breaks, got the bounces, and made the three and four footers to stay alive. I'm not going to be able to keep doing that." Kaymer missed two birdie chances on the par fives, but a share of the lead was a good position for the German, who is a former world number one but has gone winless for more than two years. "It's very important that you enjoy the day. It's a rare opportunity that you're in the leading group for one of the biggest tournaments we play all year," he said. Spain's Garcia at one point reached 10 under before dropping back to nine under with Senden, who is already a winner on the Tour this year at the Valspar Championship in March. The pair sit one stroke ahead of Australia's Matt Jones and Americans Gary Woodland and George McNeill. Northern Ireland's Rory McIlroy, who hit five birdies on the back nine to make amends for a sloppy start to his third round, finished three under on the day and also for the tournament. "If I had just kept it around even par for the front nine, I'd be up near the leaders," said McIlroy, the 2011 US Open champion. "I felt like I wasn't playing as badly as the score was suggesting today. I'd hit five greens in seven holes and I was four over par." Australia's Adam Scott shares the same mark as McIlroy in tied 28th and requires a top-16 finish to replace Tiger Woods as world number one. Sweden's Henrik Stenson can also reach the top of the rankings with a top six finish but shares 14th place with nine other players, including Masters champion Bubba Watson, on five under.